Early in the morning of Sunday December 9th, Chris Marr was found with serious head injuries in Bank Street, North Berwick. Though rushed to Edinburgh’s Royal Infirmary, he died soon after. The police, so far, are treating the death as ‘unexplained’ and have no firm evidence to substantiate any of the rumours of foul play now buzzing round the town. An explanation will be established, probably soon. But that doesn’t help those of us who knew him come to terms with our loss. My first contact with Chris was literal—at NB Primary when it was still in what is now the Community Centre. It was a robust contact, he was two years older and we were playing football on the tarmac at the back of the school when he shoulder-charged me out of the way. He was a robust, crusty character even then—quiet-spoken, direct but a hair-trigger temper that suffered no fools. But when there were apples to be scrumped or snowfall offered sledging down the Greenheads, Chris was to the fore. Which is as it should have been. Coming from a long line of North Berwick fisher folk, the Marrs had provided their share of local harbourmasters and seasoned sailors for the Royal Navy when the colours called. His family lived first at 34 then 43 Melbourne Place, within spitting distance of the sea. In the fifties father Fred brought a modern boat in among the small zulus and one seine netter in the harbour—a trig wooden motor boat with a high fo’cstle and wheelhouse for’ard and work space aft he called the Girl Pat after his only daughter and younger sister to Chris. Though bright enough, Chris was no academic. By the time he was fifteen, he was already helping Fred at the creels over his summer holidays. Soon after, he left school to make it permanent. But, like Chris, Fred wasn’t content with just lifting crabs and lobsters for its seasonal living. He secured the NLB contract to ferry lighthouse keeprs and their supplies out to Fidra and Bass Rock. In this role, the two of them featured in a scene from a promotional colour film made in the 1960’s by the town council, called “A View from the Bass“. Still this wasn’t enough for them, so in 1970, remembering David Tweedie’s success with pleasure launches in the 1950’s, they invested in the original Sula to take people on summer cruises round Bass Rock. This was soon replaced by Sula II in 1972, a clinker-built open 76-seater brought all the way up from Norfolk for the purpose. Soon this became the highlight of any summer visit to the town, with Fred and Chris growing their carrot blonde hair and beards in the flowing fashion of the time, they looked like a crew more appropriate to a longship of the Viking era. Business grew so that they could both afford impressive neighbouring houses at the harbour end of Victoria Road. Chris married Meg and three daughters followed in the six years to 1982. As well as ferrying visitors and lighthouse loads, academic interest in seabirds was growing and so boatloads of ornithologists and artists were added to the summer traffic. 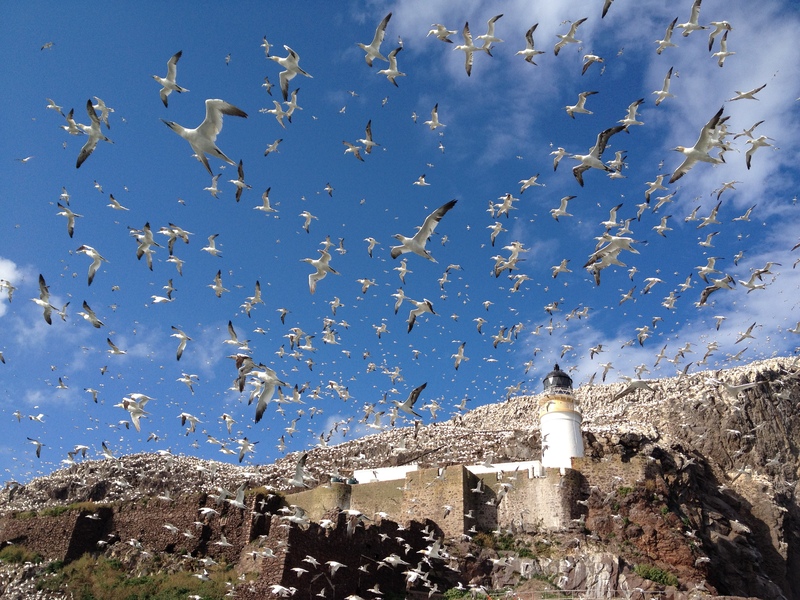 At the time, the gannet population on Bass Rock only covered the cliffs and a fraction of its top and Fidra had not been overrun by gulls so landing trips with time on either island were commonplace. Taking over from Fred’s short, gruff trip commentary, Chris added more extensive data on the fauna and, developing his interest in local history and scuba diving, peppered each trip with more historical snippets and details of wrecks. The more he learned and explored, the more his enthusiasm grew until he was spending days in the winter off-season researching details in the local History Centre in Haddington and becoming something of an expert in 100+year-old back issues of the Courier. Business during the summer months became so intense that sister Pat and even her husband Ken Macaulay were recruited as crew. And, though none of his own daughters took to the sea like their dad and grandad, his nephew would get hauled in on occasion. By the millennium, Fred, along with ‘Craw’ Pearson, was regarded as the the last of real characters, the fisher folk ‘old guard’ who had dominated the local harbour for so long until yachts and dinghies displaced the few working boats. Fred’s career high point may have been piloting Prince Charles round the Bass as part of the Scottish Seabird Centre opening in 2000. But, as Fred aged and participated less, Chris became the more recognisable figure with local and visitor alike. His greying red hair, erect military bearing and purposeful stride were unmistakable from a mile off. To say he was loved (other than by family) might stretch a point. His bearing was stiff—a body language some found off-putting; if you were incompetent or forgetful around him, his impatient anger could be merciless. But, catch him in the corner of the Auld Hoose bar of an evening and ply him with a pint and informed questions about the wreck of the Fusilier or the U-Boat off Dunbar and, if your knowledge could keep your end of the conversation up, you’d learn more detailed local history in an hour than any other way. The man had passion, a great love for his home town and a mind broad enough to absorb and integrate its myriad stories. After the daughters had left home, he and Meg split up, eventually selling the home, with Chris landing back in Melbourne Place a stone’s throw from the sea and literally across the road from where he’d grown up. 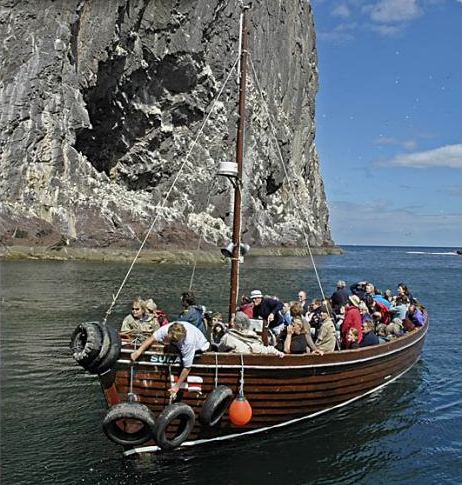 But he still ran Sula II with a level of boatmanship that 40+ years of guiding some three million people out to the amazing sight of Bass Rock had made exemplary. To see him pirouette the 12m boat with 70 people aboard inside the crowded confines of NB Harbour was to see a master at work. A quiet man who kept things personal, few guessed he was losing his enthusiasm after doing that same trip over and over again over all that time. 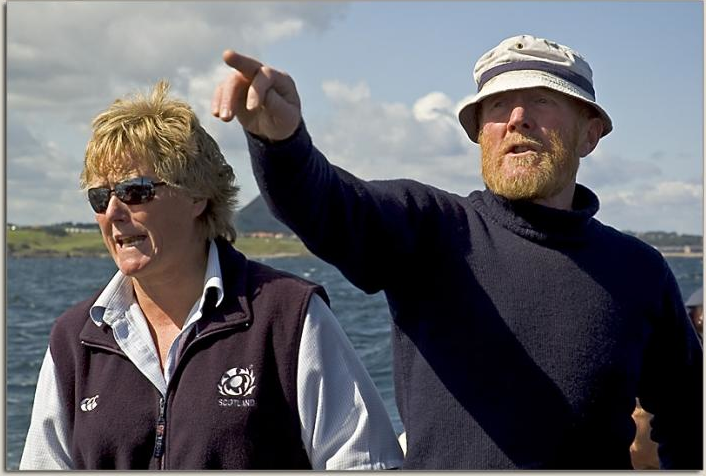 And so, in agreement with Pat, 2010 was the last season of trips on Sula II with Chris at the helm. The business and boat were sold and another operator, who has struggled to approach the 8,000+ passengers each season that Chris had attracted. For the last two years, he had more time for his local history and wreck charts, keeping himself to himself, as he had always done. Quite apart from the shock for those who knew him, for those who could recognise his erect stride a mile off, he is a loss to the whole community. With Chris, the family name of Marr, so prominent in and around North Berwick harbour for eleven generations, dies out. And we’ve lost an individual who navigated life by his own compass, melding a family tradition with his own talents to be different, unique, a man of deeds, more at home beside/on/in/under the fickle waters of the Forth than in any desk-bound office or elegant dinner party. Chris will be mourned by his family. My deep sympathy goes out to them for their great and untimely loss. But I expect that so many more—even those who crossed swords with him—will, like me, also mourn him, remembering him as his own man, a man of unique character who both loved and enriched this place he had always called home so that we came to a deeper appreciation of it ourselves. This entry was posted in Community and tagged fishermen; Chris Marr; North Berwick Harbour. Bookmark the permalink. Sad to hear this. I also have memories of Chrs, as you say not always good ones, especially when in first year at NB High and Chris in third he would chase you down the Law Brae on his bike, which he rode at a ferocious speed. We both lived in Victoria Road, and, though I didn’t know it at the time, were distantly related. My grandmother, who I never met was Isabella Marr, and my dad James Marr Briggs. One of the last real fishermen. Thanks Dave Berry for your moving tribute. Very well put Dave, I was deeply saddened to learn of Chris’s passing. I too, was deeply saddened to hear the sad news. I didn’t know Chris personally, but enjoyed his commentary on numerous boat trips around the Bass and Fidra. I taught his three daughters at High School. Lovely girls, and a lovely family. My heart goes out to them, and to Pat. I was sorry to hear the sad news. Dave – I would like to commend you for the wonderful tribute. I also knew Chris, he didn’t get along with my cousins Jim & Benjy Pearson, also fishermen of North Berwick. I think they were in competition with each other! I was saddened to hear about Chris’s untimely death. I had gone round the Bass with him a few times. He. Will be missed I’m sure, just as my uncle Jim Pearson is missed. May they both rest in peace along with my cousin, young Jim ! What a beautifully written obituary Dave. Although Chris was older than myself, everyone knew the Marrs in NB. I was fortunate enough to be taken around the bass rock a few years ago in Sula II with him at the helm. My condolences to his daughters and Pat. I enjoyed many trips with Chris and his father to Bass Rock and Fidra with my children when they were young. Shocked and greatly saddened to hear of Chris’ untimely death. My thoughts are with his family.R.I.P. Chris. I have been deeply moved by touching comments from so many people both here and in person at the sad news about Chris. I am also relieved if I have not offended anyone in daring to attempt an obituary for such a well known character. But most of all, I am stunned by the sheer number of people whose lives Chris touched: Normally this blog seldom achieves 100 hits on a busy day. In the two days since posting, there have been more than 2,000—well over 20 times normal traffic. only ever met him once – with Spike and Mick the weekend when the Blenheim was closing. Had a couple of pints with him in the Ship. An hour of laughter – funny stories of past fiends of theirs. Seemed like a really decent bloke. Just found out about the untimely passing of Chris. He was a good friend when growing up and into our teens. Unfortunately I lost touch with Chris when I moved away from NB in the 6o’s. Many memories such as going out with Chris and his Dad hauling creels,playing cards in the attic of the storage cottage and generally being really good friends. Comes as a bit of a shock as I thought I would be able to look him up when next in NB. R.I.P old friend. Very shocked to just find out about the untimely passing of Chris. Chris was a really good friend when growing up and into my teens. Unfortunately I lost touch when I moved away from NB in the 60’s. I remember as youngsters(not sure of ages) having a scrap with Chris that seemed to go on for ages,but shaking hands at the end. Fond memories of going out with Chris and his Fred hauling creels,playing cards in the attic of the cottage on the green(used for storing creels and other fishing stuff) and generally hanging around. I was hoping to look Chris up when next visiting NB so sadly this wont happen now. R.I.P old friend.